Mouse study shows molecule controls blood sugar by hitting elusive drug target. Although it was first reported 65 years ago, IDE has proved difficult to inhibit. Most of the potential candidates were either too unstable to persist in the body, or lacked the specificity to block IDE without also blocking other important proteins. Liu therefore teamed up with his colleague Alan Saghatelian and with others to screen a wide range of molecules for those that are both stable and specific. They then tested the effects of the strongest candidate molecule in lean and obese mice given glucose. As expected, blood sugar levels dropped faster in those that received the inhibitor than in control mice, whether the mice were lean or obese. But the team also found something surprising: the IDE inhibitor had the opposite effect when the mice were injected with glucose rather than ingesting it. Liu and his colleagues suggest that the reason for the different responses could be that IDE also affects two other gut hormones that regulate blood sugar: amylin and glucagon. For example, mice that received the inhibitor had higher levels of glucagon, a hormone that boosts blood sugar levels, following glucose injection. Anti-diabetic activity of insulin-degrading enzyme inhibitors mediated by multiple hormones. Despite decades of speculation that inhibiting endogenous insulin degradation might treat type-2 diabetes, and the identification of IDE (insulin-degrading enzyme) as a diabetes susceptibility gene, the relationship between the activity of the zinc metalloprotein IDE and glucose homeostasis remains unclear. Although Ide-/- mice have elevated insulin levels, they exhibit impaired, rather than improved, glucose tolerance that may arise from compensatory insulin signalling dysfunction. IDE inhibitors that are active in vivo are therefore needed to elucidate IDE's physiological roles and to determine its potential to serve as a target for the treatment of diabetes. 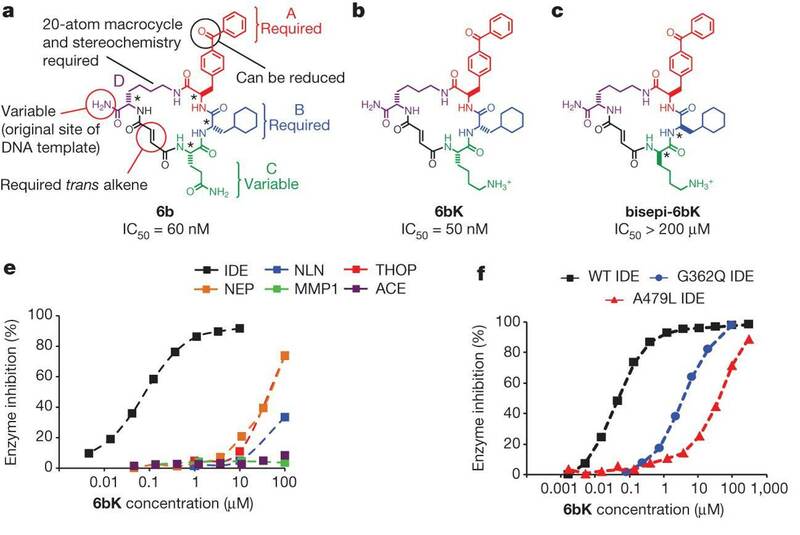 Here we report the discovery of a physiologically active IDE inhibitor identified from a DNA-templated macrocycle library. An X-ray structure of the macrocycle bound to IDE reveals that it engages a binding pocket away from the catalytic site, which explains its remarkable selectivity. Treatment of lean and obese mice with this inhibitor shows that IDE regulates the abundance and signalling of glucagon and amylin, in addition to that of insulin. 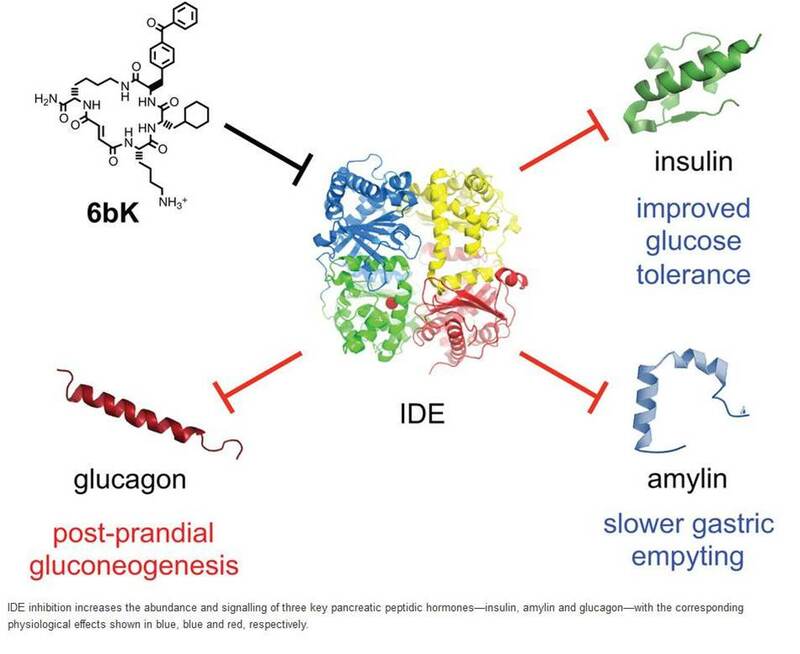 Under physiological conditions that augment insulin and amylin levels, such as oral glucose administration, acute IDE inhibition leads to substantially improved glucose tolerance and slower gastric emptying. These findings demonstrate the feasibility of modulating IDE activity as a new therapeutic strategy to treat type-2 diabetes and expand our understanding of the roles of IDE in glucose and hormone regulation. Potent and highly selective macrocyclic IDE inhibitors from the in vitro selection of a DNA-templated macrocycle library. Tips: See More Research Abstracts, Antibody Stainings, Immunoassay Kits Curves and Sequences by clicking the tabs on the top.